Mughal paintings must always rank proudly in the comparative scales of the worlds art in its singularity of style, its originality and its superb drawing. 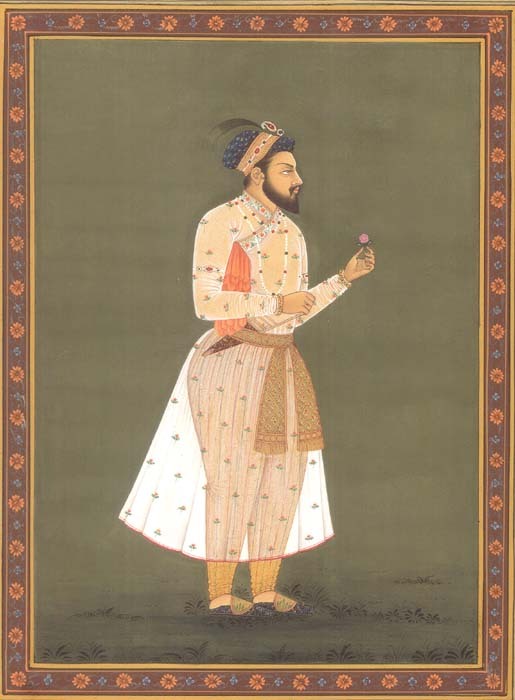 Portraiture was the forte of Mughal art. Though Shah Jahan's reign saw a spurt of wonderful architecture, painting was not neglected. His albums include portraits of his sons done in different styles. His favourite son Dara Shokuh is shown in the conventional portrait manner, standing in profile against an olive green background. He is dressed in a transparent jama and an exquisitely woven patka. His turban is richly decorated with a Sarpech, a kalza and a plume. The features in profile show a wide forehead, an aquiline nose and a shapely chin which the beard can barely conceal, in fact, the subtle modeling of the features is excellent. The artist applies the paint lightly, not using too many contrasting colours. The green of the background uplifts the portrait into prominence.